The empire of the Chola kings of Tamil Nadu, embraced by the holy Kāverī River, was a lush fertile land that was the cradle of the bhakti movement. Within it lie about 40 Śrī Vaishnava divya deśas close to each other that are hallowed by their association with the līlās of the Lord and the anubhāvas of the Āḻvārs who sung about them. One among them is Thiru Mandangudi, which is the Avatāra kṣetra of Thondaradipodi Āḻvār. He is believed to be the amśa of the Lord's “Vaijayantī” (his favourite ornament) and was born in a Brahmin family. The family thought of Śrīman Nārāyaṇa as their treasure and bhakti to him as their only tradition. The child came with a divine aura around him on Kettai Nakṣatra of Mārgazhi month and was named “Vipra Nārāyaṇa”. Even as child, he showed a sweet, sāttvic nature and was well trained by his father in scriptures. He remained detached from worldly life and was wedded to his service to the Lord and to his devotees. He came to be called as Thondar-adi-podi (dust of the feet of the devotees of the Lord) referring to his humility and his devotion to Bhāgavatas. Once, he left Mandangudi on a pilgrimage and headed towards Srirangam, the foremost among divya deśas. Śrī Raṅganātha captivated his mind in the very first darśan and the Āḻvār who came on a tour remained there in a grove near the temple permanently. He could not bear to go away from the Lord whose beauty and grace he describes in his verses. He constantly recaptured the saulabhya of the Lord who lay down facing Lanka in the south to bless his devotee Vibhīṣaṇa who was disconsolate at the prospect of separation from him. Thondaradipodi enjoys the mercy of the Lord in his Rāma-Avatāra, the captivating charm of his Krishna-Avatāra and his special grace towards bhaktas like Gajendra in his work “Tirumāḷai”(45 verses). He also sang the Thirupalliyezhuchi to awaken the Lord which is recited in daily "Ārādhanā". The Āḻvār created a beautiful garden full of fragrant flowers and Tulasī. He used to spend all his time in his garden tending it and making beautiful garlands that glimmered with love and care. 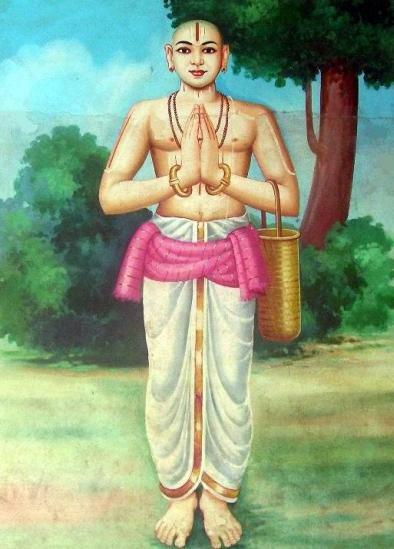 Thondaradipodi lived in a small hut within the garden, visiting the temple thrice every day to have darśan. Around this time, there lived in Srirangam two glamorous, bewitching court dancers named Devi and Devadevī. They were extremely proud of their beauty and proficiency in fine arts and they enjoyed royal patronage. Once they came to the temple to dance before the Lord during Utsava (festivity) and were drawn into the Āḻvār's garden, which captivated them. There they met the Thondaradipodi Āḻvār engrossed in his work, his mind constantly meditating on the Lord. Devadevī fell in love with him and was upset to note that he paid no attention to her. Her sister warned her about getting infatuated with a man who was above the influence of worldly desires. Devadevī, enraged by this advice, swore to turn the attention of this saint towards her charms within a month. She left with her sister to return to the garden dressed in simple clothes and approached the Āḻvār. She fell at his feet and begged him to accept her as his disciple seeking to perform service to him and to the Lord. The Āḻvār, a simple soul, accepted her at face value and was pleased to watch the commitment with which she served him. Slowly the Lord's Māyā diverted the Āḻvār's attention to the girl and the girl herself got involved more than what she bargained for. After sometime, she expressed a desire to go back to her house to see her mother and sister. The Āḻvār, unable to tolerate separation, left with her and settled down in her place. Soon he was deprived of all his wealth by the girl's mother who kept demanding more money all the time. Finally when Thondaradipodi had nothing to give, the mother turned him out. He returned in deep sorrow to his garden while Devadevī mourned his sorry state and her helplessness. He went to Devadevī's mother calling himself as the Āḻvār's servant and handed over a big gold vessel from the temple to her. The lady rejoiced over the very valuable gift and reluctant to lose the Āḻvār, sent Śrī Raṅganātha back to invite the Āḻvār. The Lord went to his devotee carrying the message and the Āḻvār rushed back to his beloved. The very next morning, the temple priest noticed the valuable vessel missing and reported the loss to the king. The king ordered a massive search and the vessel was found in the dancer's house. Devadevī's mother pleaded that the vessel was brought by the Āḻvār's servant while the Āḻvār swore he had no servant nor had he any valuable wealth. The king refused to believe him and locked him up in a cell where the Āḻvār spent a sleepless night pleading to the Lord. That night Śrī Raṅganātha appeared in the king's dream and explained that he had chosen to go on the Āḻvār's behalf to help him: The Lord made it clear that He was a devoted servant of his bhaktas and chose to humble himself in any way for them. The king woke up in the morning realising that he had committed a grave sin of ill-treating a great devotee. He had heard of Śrī Krishna going as messenger for the Pāṇḍavas and as Arjuna's charioteer during the war. The king realized that he had seen a miracle enacting itself before his own eyes and rushed to free the Āḻvār. He later took him in a bedecked palanquin to the temple and watched the Thondaradipodi Āḻvār rush to the sanctum sanctorum to have a darśan of the Lord who came to his service in all his mercy. From that day the Thondaradipodi Āḻvār went back to his sadhana and service to the Lord and bhaktas. Devadevī joined him in his humble abode. She and the king turned ardent devotees of the Āḻvār and spent their lives at his feet holding onto them as the means for their spiritual progress. The lives of great souls like Thondaradipodi Āḻvār transformed the lives of people who lived around them. Their works continue to live after them through ages enabling us to sing the praise of the Lord and to share the mystical experience of these great souls.